While I really dig Cooper’s Pale Ale, sometimes it just doesn’t sit well over the course of a night. 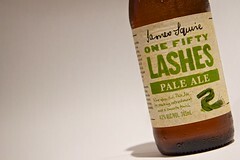 In my quest to find a session pale ale, I picked up James Squire’s new One Fifty Lashes. A bit lacking in the flavour hit and almost sweet overtones. It sits okay over several beers but I can’t help but feel it’s missing something in the flavour and aroma department.